The Oregon Coast, Crater Lake, Wallowa Mountains, Columbia River Gorge, Mt. Hood, Smith Rock and the Painted Hills. These magnificent points of natural beauty make up the 7 Wonders of Oregon. Few road trips can boast the scenery of a drive in Oregon, and this epic route takes in not one, but two of Oregon’s 7 Wonders. It begins with the first, the Oregon Coast, 363 miles of rich and varied scenery. From there, it’s east through forest, vineyards, orchards and mountain passes, until you arrive at the second wonder, Crater Lake, the deepest lake in the U.S. 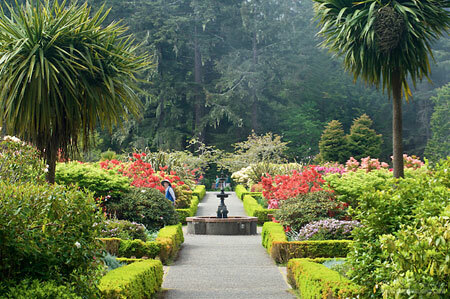 Begin your trip in 1) Coos Bay on U.S. Highway 101 (aka the Pacific Coast Scenic Byway), then head west on the Cape Arago Highway to Shore Acres State Park, noted for its famous botanical gardens on the estate once belonging to lumber baron Louis Simpson. Here you can watch for whales, meet with master gardeners or just relax in the lush beauty. Back in Coos Bay, explore the dunes by foot, buggy, horseback or test your mettle on a sandboard. About a half an hour drive south, you’ll find the town of 2) Bandon, known worldwide as the home to Bandon Dunes Golf Resort. Featuring five links golf courses set among the dunes and pines, the resort has won accolade upon accolade for some of the best golfing in the world. The resort also offers a half a dozen restaurants and five lodges. This little town also has a rich history for cheese making, and you won’t want to miss the samples at the new and already award-winning Face Rock Creamery — named for the boulder formations that you can view from the nearby Face Rock State Scenic Viewpoint. Continue south through the forests of Douglas Firs and soon you’ll find yourself approaching the tiny town of 3) Port Orford, the northern Gateway to America’s Wild Rivers, and home to the WildSpring Guest Habitat. This eco-friendly resort is set on five acres of forested luxury; you can soak in the open-air hot tub, indulge in a massage and relax in a private cabin amidst art and antiques. You’ll know you’ve reached 4) Gold Beach when you round the bend and catch sight of the historic, art deco-themed Isaac Lee Patterson Bridge, framing a dramatic entrance to the town that bills itself as “Nature’s Wild Side.” This is a fisherman’s paradise and also the home of Jerry’s Rogue Jets, boats that zip passengers up the Rogue River along a historic mail route into the wilderness. If you’re looking to overnight in Gold Beach, you can’t do better than a room at the Tu Tu’ Tun Lodge, repeatedly named one of the best and most romantic hotels in the U.S.
Four miles north of Brookings you’ll enter the 5) Samuel H. Boardman State Scenic Corridor, 12 miles of natural outdoor opportunities and scenic beauty, including 300-year-old Sitka Spruce trees, the Arch Rock and Natural Bridges formations and a spectacularly rugged coastline punctuated with small sandy beaches. Before you leave 6) Brookings, be sure to stop by the Capella By The Sea. Built by filmmaker Elmo Williams in memory of his wife, this little chapel is at once a tranquil sanctuary and a work of art rendered in local wood, rock and slate. 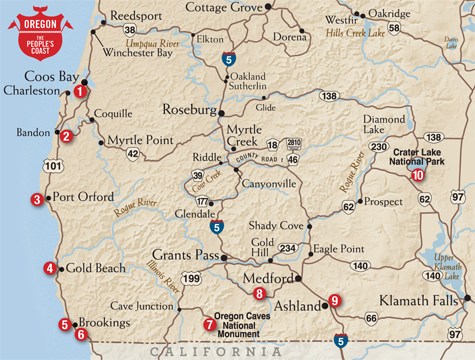 Now the trip turns inland, as you tuck down into California to connect with U.S. Highway 199 and head north to the 7) Oregon Caves National Monument. Grab your coat and hiking boots for a trip underground through the halls of a rare marble cave. The tour can be strenuous, so if that’s not your speed, opt instead to explore the Oregon Caves Chateau, a six-story hotel crafted in 1934, and listed on the National Parks Great Lodges and a National Historic Landmark. Back on the road, continue east along the 8) Applegate Valley Wine Trail, which has some of the prettiest wine country in the state. Eighteen wineries await, offering samples and tours in a verdant countryside where the pace is slow and new friendships form fast. Try some of the warmer climate varietals like tempranillo and malbec. No one attraction so defines the city of 9) Ashland as the world renowned Oregon Shakespeare Festival. Treat yourself to world-class performances, the evening Green Show and backstage tours. Or bone up on the theater world with a class. From Ashland, head east and then north toward 10) Crater Lake National Park. At 1,949 feet deep, the lake is seventh deepest in the world. Formed during the eruption of Mt. Mazama, 7,700 years ago, Crater Lake features glacial blue water, a pair of islands and an abundance of wildlife and rugged backcountry scenery. Spend the night in the historic Crater Lake Lodge, hike down to the lakeshore or just grab bite in the lodge restaurant. Either way, you can’t beat the views. And you can’t beat Oregon’s many wonders.